The restoration of the Stable Mansion at the Beylerbeyi Palace compound on the Asian shore of the Bosporus has been completed, and the site will soon open as a museum, reports said Thursday. The Mansion – a luxurious stable for horses belonging to the sultanate during the Ottoman era – was built at Beylerbeyi Palace upon the order of Sultan Abdülaziz, who was known for his love of horses. Restoration of the building – which is considered the most beautiful example of the era and reflects the horse culture of its time – began eight years ago to address the damages to the building that have occurred in the more than 150 years since its construction. The stable is an example of neoclassical architecture melded with Turkish culture, consisting of 20 wooden sections and a room with horse and animal motifs on the ceiling. Ahmet Çapoğlu, vice chairman in charge of restoration at the National Palaces Administration, told Anadolu Agency that the restoration process was carried out with utmost care to preserve the original structure. "There has been no intervention in any way that would harm the original elements of the structure," he said. Within the comprehensive restoration, both the tent-like exterior of the mansion and its interior were renewed and the paintings on the ceiling were repaired in accordance with the original structure. 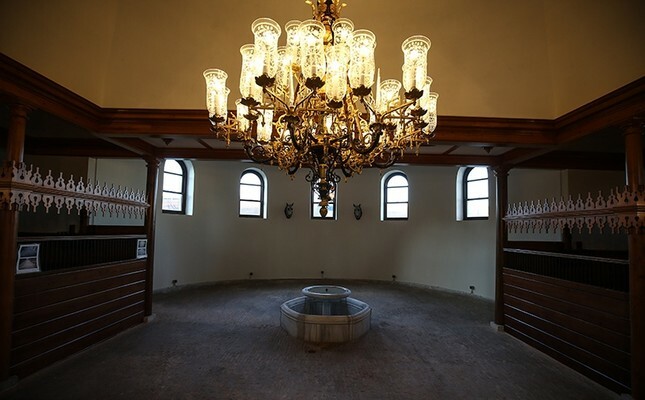 Çapoğlu said that once the mansion is opened to visitors, it "will be a popular destination for those interested in history and architecture, as well as for those interested in horse culture." Sultan Abdülaziz ordered the construction of Beylerbeyi Palace, which lasted only four years from 1861 to 1865. The design of the palace was influenced by French Neo-baroque style with a traditional Ottoman house plan. The palace includes a lush garden full of various plants and trees and two kiosks by the pier where sultans could enjoy the weather and an ideal view of the Bosporus. The sultans of the Ottoman Era used Beylerbeyi Palace to entertain guests visiting from foreign countries. During the summer months, guests were accommodated at the palace, where they could stay cool and live in luxury. The first foreign guest to stay in the palace was Empress Eugenie of France followed by the Prince of Serbia, King Nicholas of Montenegro, Austro-Hungary Emperor Franz Joseph, Shah Nasser al-Din Qajar of Persia, Prince Oscar of Sweden and many more.